Home > Articles and Insights > Should I have a premarital agreement? Should I have a premarital agreement? People contemplating marriage choose to enter into premarital agreements for a variety of reasons. Some have been through a messy divorce and want to make sure that what happened in the dissolution of a prior marriage does not happen again. Others are business owners who want to insulate their companies and business partners from the financial and operational difficulties that can occur when one of the owners, or even the company itself, becomes involved in domestic litigation. Many are simply people who want to have a clear understanding of what will happen in the event their marriage doesn’t work out. Although premarital agreements are more common these days, the term “premarital agreement” still has a negative connotation for a lot of people. The image that often comes to mind is that of a calculating individual presenting a convoluted and one-sided legal document to his or her betrothed on the eve of their wedding and demanding that it be signed without any opportunity for meaningful discussion. To be sure, that scenario would make for a tense and uncomfortable beginning to a life as a married couple. But it doesn’t have to be that way. An effective premarital agreement is one that protects your interests without putting your spouse-to-be at a significant disadvantage. With this in mind, here are a few things to consider. First, it’s important for both parties to be relatively equal in the bargaining process. Negotiating an agreement that addresses the possible end of your upcoming marriage can be awkward, and it’s tempting to put off having those discussions. Don’t procrastinate. If you decide that you want a premarital agreement, it should be drafted far enough in advance of the wedding to allow both parties to review it and propose any changes they think are appropriate. If one party has an attorney, the other should have his or her own independent legal counsel. This ensures that each party understands the terms and legal effect of the agreement, and makes the agreement less susceptible to attacks on its enforceability. Second, the agreement should be substantively fair to both parties. For example, it is usually fair and reasonable to agree that property owned by either person before the marriage will remain that person’s separate property during and after the marriage, regardless of how it may be titled. It is less reasonable to have an agreement that allows one person to make essentially all assets acquired during the marriage that person’s separate property. Remember that the other person signing this agreement is someone with whom you plan to have a close, intimate, and (ideally) long-term relationship. Insisting on terms that put that person at a serious disadvantage creates an inequality between the two of you that can lead to resentment and unhappiness. Finally, be sure to include a provision that addresses the requirements for modification of the agreement. Premarital agreements frequently address not only the division of property in the event of a divorce, but also the ownership of property and the ability to liquidate or dispose of property during the marriage. It’s impossible to anticipate everything that might happen over the years, and the provisions that you agreed on before you were married may not fit your needs 10 or 20 years later. Having clearly specified procedures for modifying the agreement gives you the flexibility to make changes when necessary. 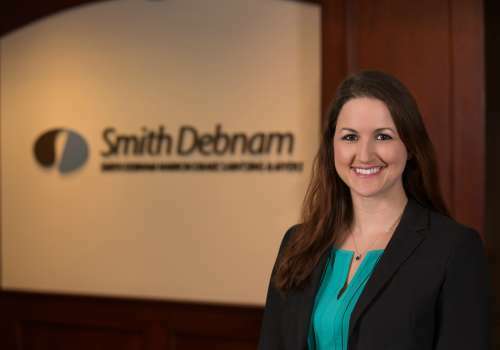 If you have any questions or would like more information on this topic, please contact attorney Alicia Jurney at 919.250.2179 or by email at ajurney@smithdebnamlaw.com.